BVAdvanced offers a full range of Fully Synthetic and very high quality, High Viscosity Index Mineral Oil and partial synthetic lubricants for Industrial Applications. Be sure to also view the sections on Air Compressor and Food Grade lubricants as well as our general lisitng. 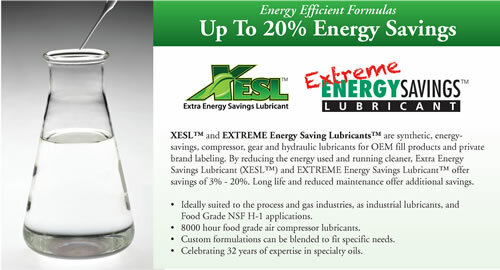 Cost Savings through use of Synthetic Lubricants Synthetic lubricants enhance energy efficiency. Because of their unique properties, synthetic lubricants such as polyalphaolefin (PAOs), and polyalkyle ne glycols (PAG) help reduce traction in finished lubricants and minimizing friction. They also “stay in grade” longer so that increased viscosity does not lead to increased power consumption. BVAdvanced has develop several improvements in synthetic lubricant technology that can result in even more energy savings. Today’s smaller equipment runs hotter which can lead to increases oxidation and thermal breakdown. This in turn can lead to corrosion and oil thickening , Synthetic lubricant can offer improved thermal and oxidative stability while maintaining gear, bearing and seal protection and longer drain intervals. The ability of synthetic lubricants to maintain viscosity grade and film strength longer means they don’t need to be replaced as often. In some cases the lower volatility of a synthetic lubricant reduces oil consumption. When these properties are combined with the lower amount of maintenance time and production loss, synthetic lubricants often save money when compared to mineral oils.